Ensenada, Mexico– DirtFirst Racing’s Andy Lagzdins teamed up with East Coast racer Tom Wright’s Baja effort to clinch the 2013 Score Class 24 Pro ATV Championship with a 5th place finish at the Baja 1000. The team’s 3rd place finish at the San Felipe 250 and 1st place finish at the Baja 500 had the team tied in points for the Series Championship going into the Baja 1000. Canada’s PY Denault prepared the team’s Honda TRX450R for the race, and fellow Canadian Renaud Fortin and Mexico’s Francisco Vera Jr completed the squad for the 883 mile event which began at 11pm on November 14th in the center of Ensenada, Baja California. 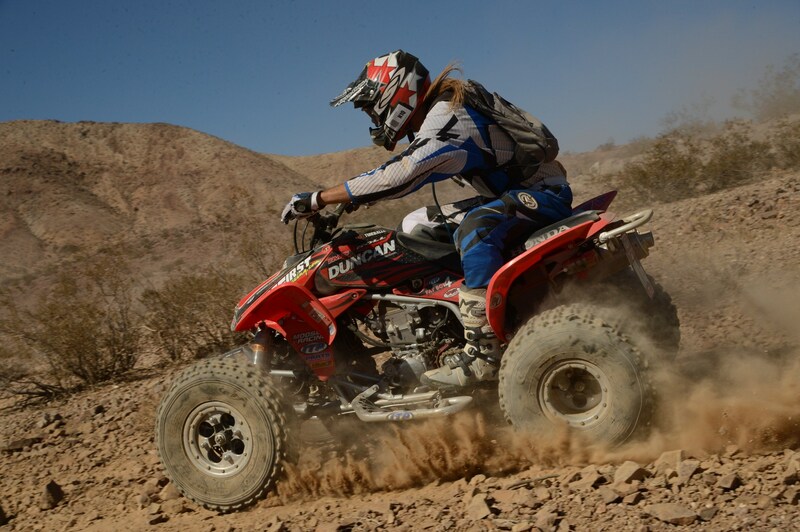 Tom Wright started the race in foggy conditions, and handed the quad over to Vera for the run out of Ensenada. While leading the class coming through the San Felipe area, Renaud Fortin was forced to pit to fix mechanical issues incurred by a crash earlier in the race. During the next 300 miles, Lagzdins and Denault steadily chipped away at the leader’s 20 minute advantage, and by the 660 mile mark were once again in the physical lead of Class 24. Unfortunately, a broken off footpeg forced Wright to ride through miles of some of the roughest Baja terrain with only a right footpeg, until he was able to repair the quad near Mike’s Sky Ranch. Vera crossed the finish line in the early hours of Saturday morning ahead of the team’s rivals for the Championship after nearly 29 hours of racing. This is the second Score Class 24 Championship for Lagzdins, having won the class and the Overall ATV Championship with Craig Christy’s team in 2009. Andy would like to thank his personal sponsors for helping him achieve another racing accomplishment: DirtFirstRacing.com, Moose Racing, Alpinestars, Elka Suspension, Duncan Racing, ITP Tires, Roll Design, TireBalls, IMS Products, GPR Stabilizers, RPM Axles and Smith Goggles. Lucerne, Ca. 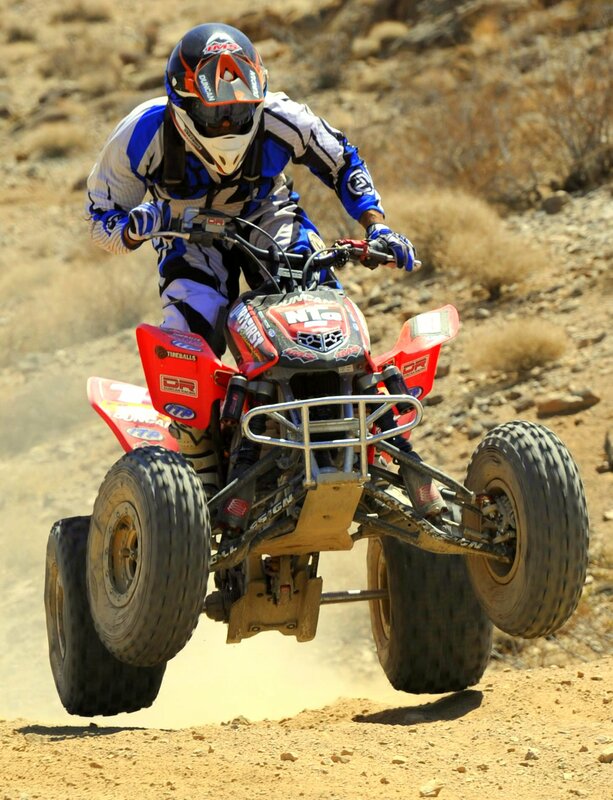 4/28/2013- DirtFirst Racing rider Andy Lagzdins took his second win of the 2013 National Hare and Hound Series at the fifth round which took place in the Johnson Valley OHV area in Lucerne Valley California. Andy has now won the Vikings NHHA race for three consecutive years. Andy’s Duncan Racing TRX450R motor powered him off the start in second place behind Utah’s Colt Brinkerhoff. “I kept Colt in sight and around the 10 mile mark we got into some deep whoops and I made the pass. From there I just paced myself to the finish line,” said Lagzdins. Honda-mounted Brinkerhoff finished second and Yamaha rider Bill Markel rounded out the podium. 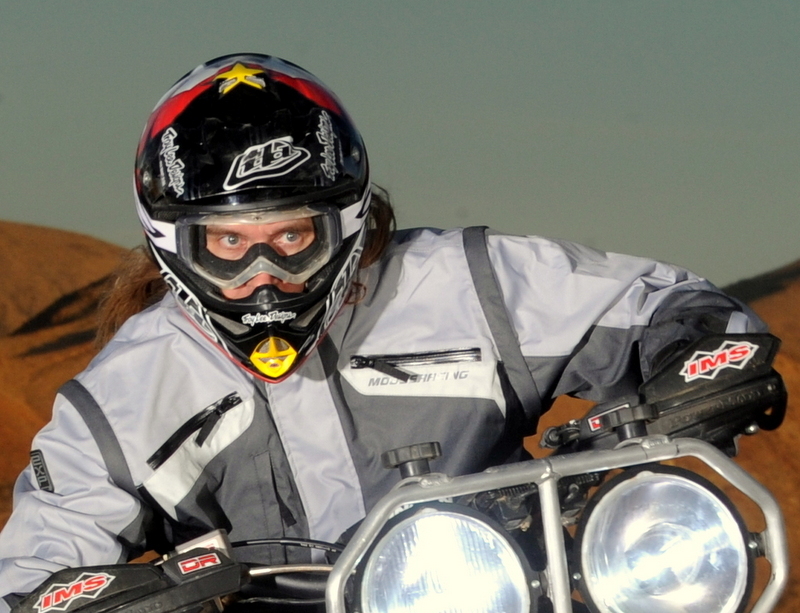 The next National Hare and Hound race will take place on May 4th at the Sugarloafers MC event in Jericho, Utah. 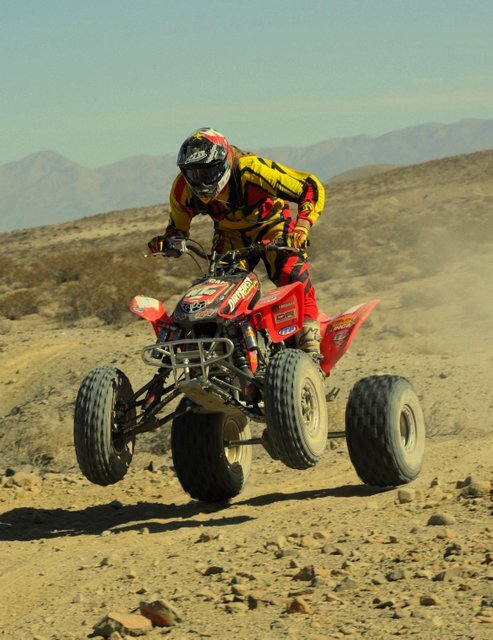 Lucerne Valley, CA.- After missing the win at the first two NHHA rounds of the year, Andy Lagzdins was on a mission to get back onto the top step of the podium at Round 3 of the Series, put on by SoCal MC in Johnson Valley. Not satisfied with the setup of his quad from last season, Andy called upon his supporters to help him in his quest for a 3rd NHHA Championship. Elka suspension built a set of Stage 5 shocks specifically for Andy’s needs, Duncan Racing ported up a fresh cylinder head with the latest valve train upgrades, and DirtFirst Racing put it all together to give Andy the best possible machine to get back on top in the National Hare and Hound Series. “It was a little close, we only had one day of testing a few days before the race,” said Andy after the race. “The shocks were so good out of the box, we ended up only setting the ride height and running the clickers where they were from the factory. There is no setup time on a Duncan motor, you just have to break it in properly and it’s good to go. By the end of the bomb run I knew we had made the right changes to the quad.” Andy led the start through the bomb, and was never challenged. The Honda of Scott Schmidt and BonFire Racing’s Bill Markel rounded out the podium. The 40 mile course laid out by the SoCal MC club had its share of challenging obstacles, mostly in the form of tight rocky canyons that had many of the quad racers lifting and pulling their machines over some of the boulders. Miles of virgin terrain contained lots of cactus and other aggressive foliage that had racers pulling needles out of their skin. Lagzdins now holds the points lead in the NHHA Series with Scott Schmidt in second and Colt Brinkerhoff in third. The next event will take place in Lucerne Valley in two weeks. Ridgecrest, Ca- DirtFirst Racing’s Andy Lagzdins put his Duncan Racing powered Honda TRX450R on the podium with a second place finish at Round 2 of the AMA National Hare and Hound Series held in the Spangler Hills OHV area in Ridgecrest, California. The 45-mile loop laid out by the Four Aces MC combined a variety of desert terrain, and Andy’s DirtFirst-prepared 450R excelled in all of it. “My quad worked so good today. The updates we made from working with Elka and Doug Roll have made my quad the best its ever been!” said the 2-time NHHA Champion. “I’m working on my starts and looking forward to being back on the top step of the podium.” After two NHHA events, Andy sits second in points for the 2013 Championship. Andy’s Quad is setup with all the best components: ITP Holeshot XCT tires with 2103/2106 TireBalls, GPR LowBoy Stabilizer, and RPM Dominator II rear axle. For details on Andy’s race quad, click here. The next round of the AMA National Hare and Hound Series takes place in Lucerne Valley, Ca on April 14th. For more info on the NHHA Series, check out NationalHareandHound.com. Lucerne Valley, Ca. 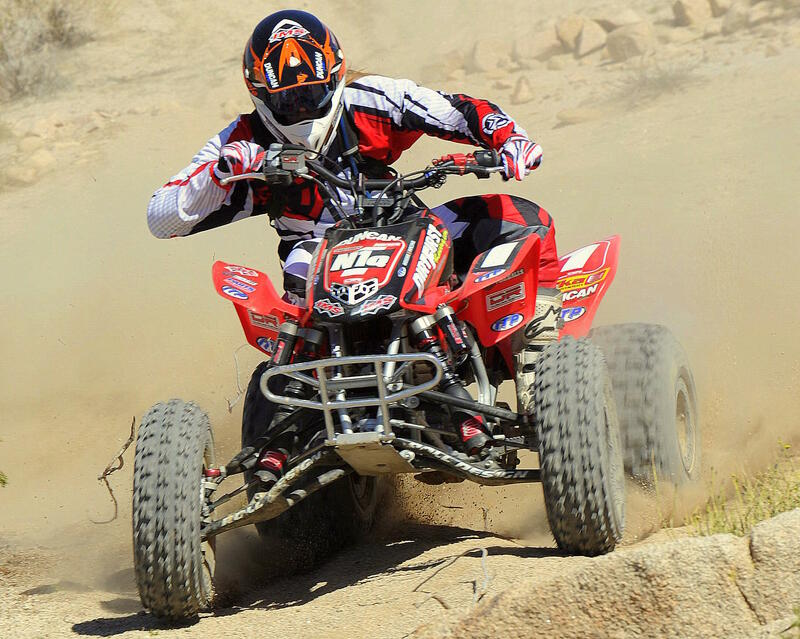 – Team DirtFirst Racing’s Andy Lagzdins began the 2013 National Hare and Hound season with a solid third place finish at the opening round put on by the Desert MC club in the Johnson Valley OHV area. The 40-mile loop hosted a wide array of terrain, consisting of rocky climbs, fast open sections, and various washes. Unique to this event was the absence of dust, as the area received a generous amount of rain in the days leading up to the race. Andy’s Duncan Racing-powered Honda TRX450R shot out to the front early, battling with Utah’s Colt Brinkerhoff during the bomb run. Settling into second place after the start, Andy soon had to hold off the advances of Matlock Racing’s Josh Caster. “It took me a while to get into the groove today,” stated Lagzdins after the race. “By the time I started to get a good pace going those two guys had too much time on me to make up by the finish. Josh and Colt rode great today. It’s going to be a fun season.” Caster would cross the finish line ahead of Brinkerhoff to take the win. The next round of the NHHA Series takes place in two weeks in Ridgecrest, California. The last round of the AMA National Hare and Hound Series took place at the North Anderson OHV Area, put on by the 100’s MC Club. 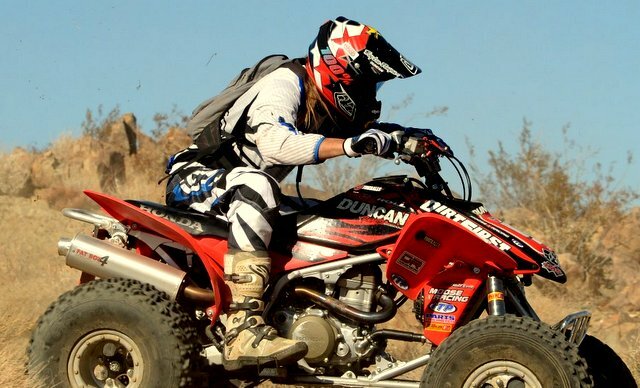 DirtFirst Racing rider Andy Lagzdins had already sealed the 2012 Overall ATV title at the previous round, but he still wanted to finish the season with a win after finishing second at the previous National. The Johnson Valley area had received some rain, but the conditions were still very dry and dusty. The 100’s MC had laid out a 40 mile course for the ATV’s, starting with a good sized bomb run that awarded the fastest rider through the banners a new pair of Alpinestars boots. Lagzdins came through in second place behind fast starter Colt Brinkerhoff. Colt held the lead for 10 miles before Andy was able to make a pass. At the 19 mile mark the course went through the pits, and at the exit Andy followed the bike banners into Loop 3. ” I had the lead and threw it away by not paying attention to the markers. I saw the 45 mile marker and then I knew what had happened,” said Lagzdins after the race. By the time Andy got back on the course he was in fifth place,but he worked past riders quickly and found himself in 2nd heading into the last few miles. “I put my head down and pushed it, hoping for the leaders to wear down. Then I saw Colt ahead of me and I knew I had to make a move soon.” Brinkerhoff was experiencing mechanical issues and had to slow slightly, allowing Lagzdins to make the final pass with the finish nearly in sight. Suzuki-mounted Shaun Riley rounded out the podium in 3rd. We would like to thank all the sponsors that helped Andy Lagzdins and DirtFirst Racing finish off the 2012 NHHA Series with a win and the Championship: Duncan Racing International, Elka Suspension, Roll Design, ITP Tires, TireBalls, RPM Dominator Axles, Hinson Products, GPR Stabilizers, Moose racing, Alpinestars, Parts Unlimited, and IMS Fuel Tanks.